I have a very faint memory that dates back to over 50 years ago when I was a little girl growing up in Ville Lasalle, and my parents brought me downtown to visit what we called “The Dollhouse”. I remember that I was enchanted with the visit but that my mother felt vaguely uncomfortable and warned me before going in that I should “be polite”. 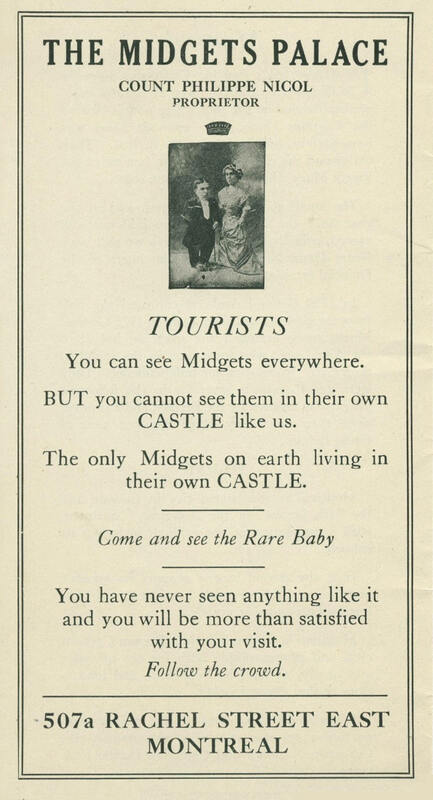 I’ve since found out that what I was visiting was “The New Midgets Palace” which was an independant business founded by Montrealers Count and Countess Nicol. It was later bought by another person of short stature – Mme Huguette Riou-Bastien – and I’m actually not yet sure who I saw when I visited! The Nicols were living in a time when there was very little respect for differences and very few opportunities for people who were considered “different”. In that context the Nichols were unusually successful in that they ran their own independant business, as opposed to many others who were exploited in the sideshow circuits. Of course, fast forward to today and you will find that “freak shows” have disappeared and Little People (as most prefer to be called) have joined mainstream society. So, I offer this postcard as an artefact of bygone days – thankfully gone! Was born in Montreal, at the Mercy Hospital corner Saint Hubert and Dorechester streets, on September 19th, 1926. 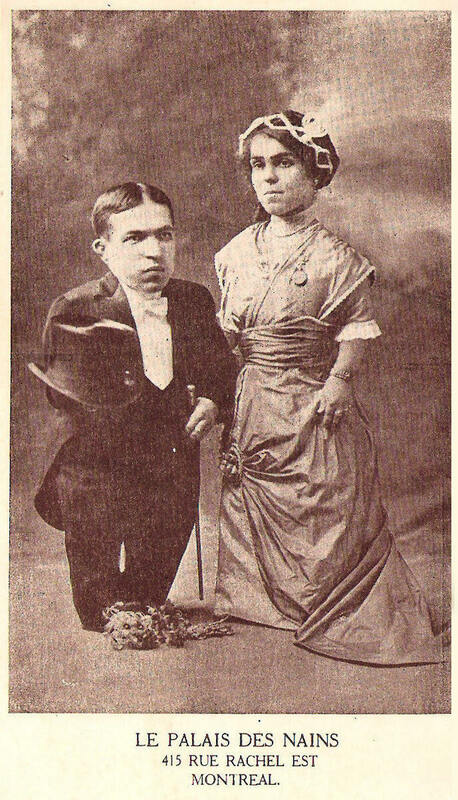 He is the son of Count Philippe Nicol and Rose Dufresne; Count and Countess Nicol are the smallest maried couple on earth, without exception. After 20 years of married life, this child, the Rare Baby, was sent to them with a mission to perform: look after his tiny Papa and Mamma in their old days. He was weighing on his birth three and one half pounds, and he is full of life. The five physicians who attended at his birth are of the opinion that he will never be taller than his father (he is now 25 inches high); but he will have a real man’s head, his father promises, and he shall be charitable and conrageous. If dad’s parents had taken care of him as he does of me, he would have been what he wants me to become: a successor to our regretted Sir Wilfrid Laurier – the man. Papa says the height counts for nothing in the making of a man. Count Nicol was born Philippe Adelard Nicole in Levis, Quebec in 1881. His Countess was Rose Semilida Dufresne and the two had been married in Lowell, Massachusetts in 1906. Philippe Adelard’s parents were Alexandre Nicole and Josephine Philomene Brousseau (daughter of Andre Brousseau and Eleonore Garon). The couple were married on March 4th, 1867 in St-Bernard (Dorchester County) Quebec. Alexandre’s parents – Olivier Nicole and Apolline Morissette were married in St-Henri (Levis, Quebec) on January 24th, 1826. Her parents were Michel Morisset and Marie-Anne Morin. Olivier was the son of another Olivier Nicole and his wife Francoise. According to the BMS index Francoise’s surname was Henry but I have not found that marriage and I have found a possible couple – Olivier Nicol and and Marie-Francoise Fleury. The parents of that couple (whom I have not confirmed as being in this line) were Olivier Nicol & Marie-Louise Brochu and Francois Fleury & Marie-Francoise Dubeau, and they were married in St-Vallier (Bellchasse, Quebec) on July 7th, 1797.